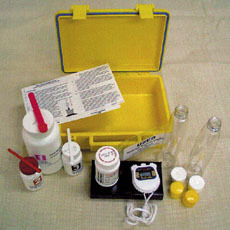 Industrial Test Systems Inc., of Rock Hill, S.C., has announced the release of its new Arsenic Field Kit. This highly sensitive Arsenic Kit is ideal for field-testing since there are no liquid reagents required. The test is as follows: simply fill the supplied bottle with the water to be tested, add Reagent 1 and swirl, add Reagent 2 and swirl, add Reagent 3 and replace the cap, and place the arsenic test strip over the opening. Wait 30 minutes and record your accurate and reliable results.